TOKYO -- The governments of Japan and the United States are planning to link up the Space Situational Awareness (SSA) systems of Japan's Self-Defense Forces (SDF) and the U.S. military from fiscal 2023 to share real-time information on such things as third-country satellites and space debris, it has been learned. In the future, the two countries hope to build a collaborative arrangement of mutual protection from potential attacks by other countries' satellites. Beefing up bilateral cooperation in space is up for discussion and confirmation at the two-plus-two talks between the diplomatic and defense officials of Japan and the U.S. that are to be held in Washington in April. Japan's space surveillance, which entails monitoring debris and suspicious satellites, is conducted by the Japan Aerospace Exploration Agency (JAXA) using satellites orbiting 200 to 1,000 kilometers above Earth. Because the SDF currently does not have its own SSA system, it is in the process of setting one up that monitors a stationary orbit about 36,000 kilometers from Earth. Since fiscal 2018, the SDF has received technical assistance from the U.S. through the American foreign military sales (FMS) program, and plans to complete the system in fiscal 2022. JAXA, furthermore, is set to install new radar by fiscal 2023, which will boost its ability to observe objects 650 kilometers from Earth from the current 1.6 meters in size to 10 centimeters. 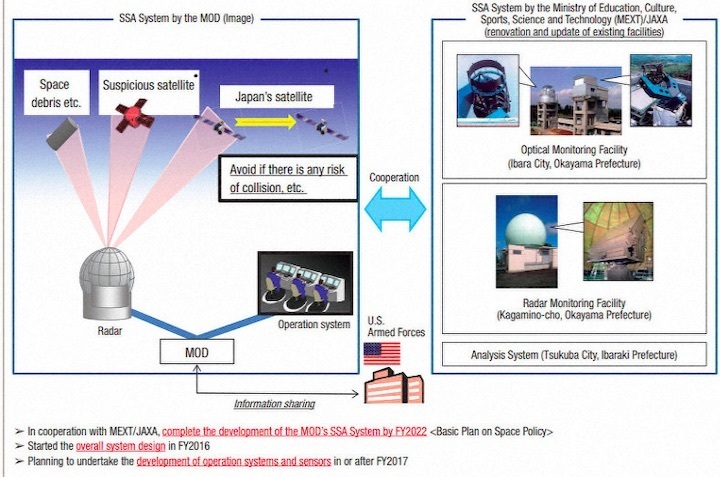 The SDF's new SSA system will be linked up with that of the U.S. military when the former begins operations in fiscal 2023, and efforts will be made to tie both up with JAXA's system. JAXA has already begun to share information with the U.S. military, and the upcoming developments are expected to accelerate the exchange of information among the three parties. Because the U.S. military's outposts in Asia are limited, its aerial reconnaissance in the region is said to be scarce. Therefore, a Japanese Defense Ministry official explained, "Japan's contribution is being sought (in this arrangement). It will be a plus for the U.S. military." To improve the precision of Japan's SSA system, the Defense Ministry included funding for research into SSA satellites equipped with optical telescopes that would be used for orbital surveillance in the fiscal 2019 budget. 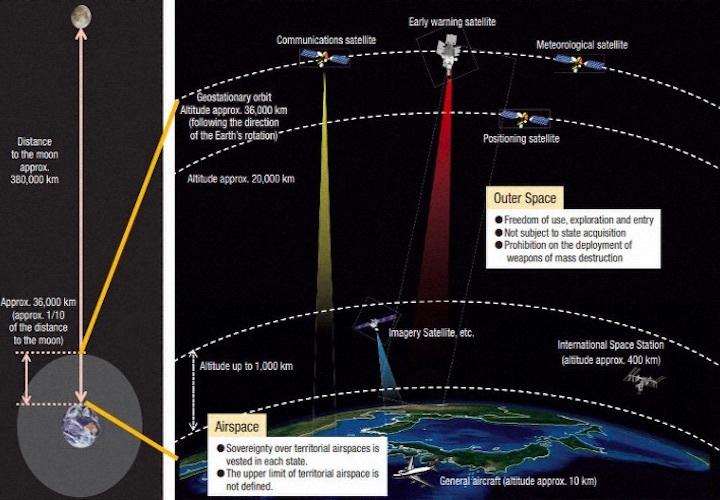 The aim is to construct an integrated surveillance system based both on the ground and in space. Still, some in the Defense Ministry have voiced concerns that merely building an SSA system is not sufficient to protect satellites in the future. The ministry's Annual White Paper from 2018 pointed out that China and Russia were in the process of developing the technology necessary for anti-satellite weapons and communications-jamming electromagnetic waves. For the time being, the ministry will seek the cooperation of the U.S. in protecting Japan's satellites, while aiming to develop independent technology to remove space debris and evade satellite attacks in the future.